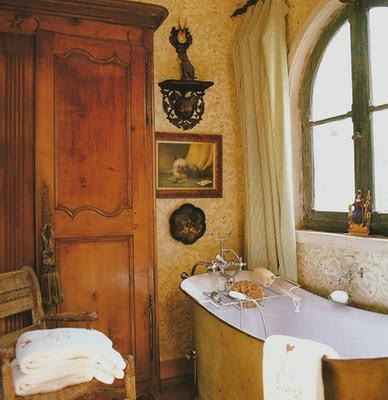 Love this bathroom with the rustic pine armoire and antique bathtub. The colors are just beautiful...The most beloved designer of Country French interiors, Charles Faudree has been working his magic on homes domestically and internationally for more than thirty-five years. His fourth book, Charles Faudree Interiors, continues to reveal his versatility in classic and international styles, and showcases his newest signature country French interior-his own new cabin nestled in the Oklahoma countryside-along with a tropical island retreat, a chic metropolitan high-rise, and homes done up in Georgian, contemporary and ranch high style.